THE MOTHER of a seven year old boy who suffered a ‘terrifying experience’ when his foot was caught in an escalator at a Sheffield shopping mall has blasted the centre’s management. Adam Strike was at Crystal Peaks shopping centre with his parents Joanna and David Strike when the escalator’s teeth grabbed hold of his plastic Croc shoe as he made his way to the upper mall. Joanna said he was standing within the yellow lines when the incident happened. She said: “As we were approaching the top where it levels out my son suddenly started to scream. “The teeth of the escalator had gripped his shoe and he couldn’t pull away. “The escalator’s teeth had ripped away the shoe around my son’s toes. If I had not been able to pull him free it would have caused much more damage. Mrs Strike, of Park Stone Delph, Charnock, complained and asked for the escalator to be shut down. She also requested £25 compensation for damage to Adam’s shoe. She said: “When the centre manager got back in contact with us, he said no fault had been found with the escalator and then went on to blame my child’s shoe. “I was issued with a poor apology and thanked for writing in. A spokesman for Crystal Peaks said: “We take the safety and wellbeing of visitors extremely seriously. “Our escalators are maintained and inspected above and beyond statutory requirements. “After the incident the escalator was immediately turned off and taken out of commission. 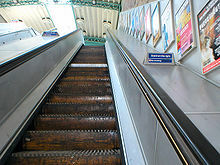 “Our maintenance company, conducted a full inspection and found no fault with the escalators. He added the centre would pay compensation for the shoe without accepting liability.